This page features some of the animals, reptiles and invertebrates found in the arid regions of the South-West USA where cacti and other succulent plants grow. You can download larger images by clicking on the pictures below. 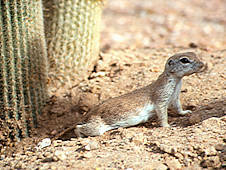 emerges from its burrow under a clump of cactus in the Desert Botanic Garden, Phoenix, Arizona. Most of their diet is green plants and they also eat seeds and insects, gaining most of their water needs from their food. Don't mess with these animals ! They are fiercer than they look. Soon after posing for its photograph, this squirrel was observed harrassing a much larger snake which eventually gave up and slithered away. Native to the South-Western USA and North-Western Mexico. Left: The pig-like Collared Peccary or Javelina (Pecari tajacu) sleeps in the shade under treees and bushes during the day and emerges in the early evening to forage for succulent foliage, including Opuntia pads and fruit. 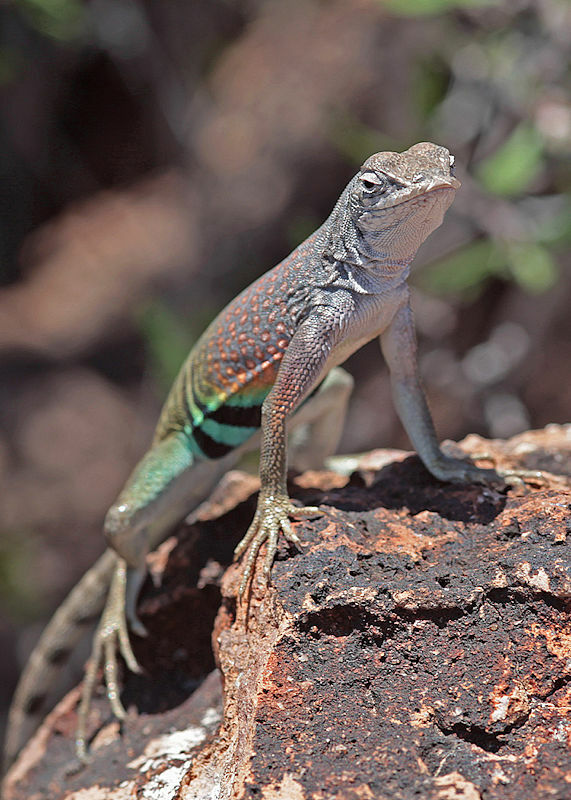 They feed on cacti, mesquite beans, Agave lechuguilla, sotol and insects. Where they are invading towns they also consume agricultural crops and garden plants including bulbs. Although these indviduals were solitary, they are commonly seen in family groups. Their sight is poor and they investigate their environment using a well-developed sense of smell. Mature males have small white tusks. 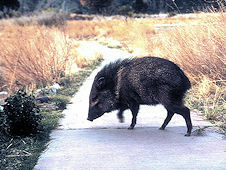 Javelinas mostly ignore people unless they feel threatened. Don't get between the adults and their young. 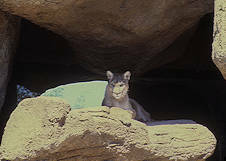 There is a Disney film, probably staged, of a male Javelina seeing off a Mountain Lion. 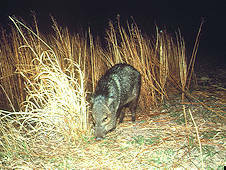 Javelina meat was used by American Indians when better food was unavailable. It was said to be rather greasy and unappetising, but others say it's better than pork. As with most meats, the result probably depends a lot on the cooking. 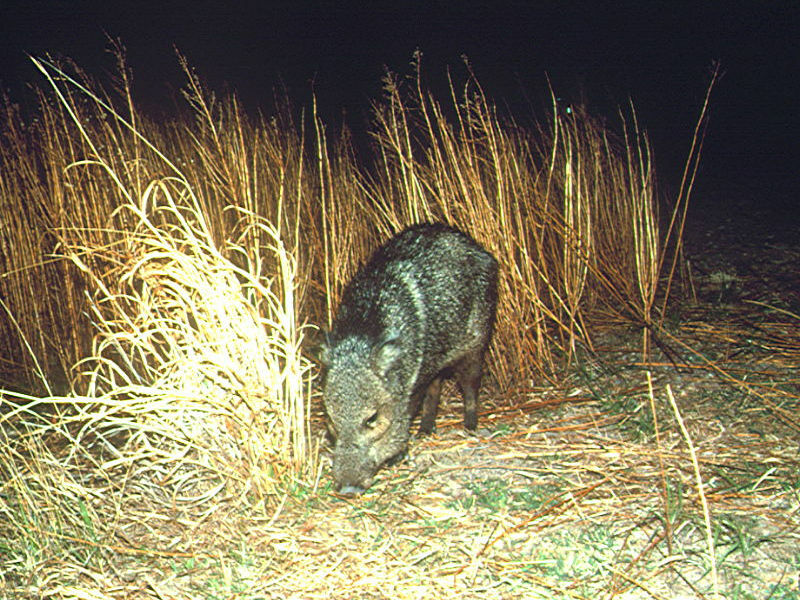 Javelinas are native to a huge range from South-Western USA to Argentina and the island of Trinidad, but only recently arrived in the USA where their range is expanding Northwards. 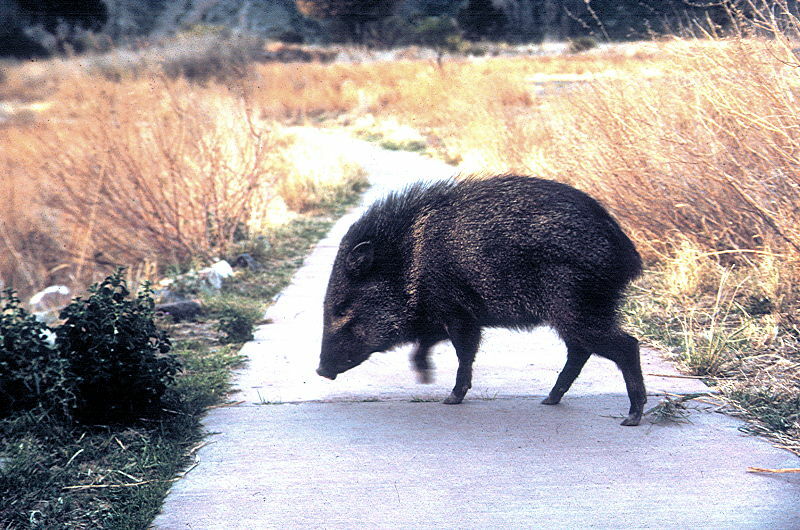 Javelinas have been introduced into Cuba. 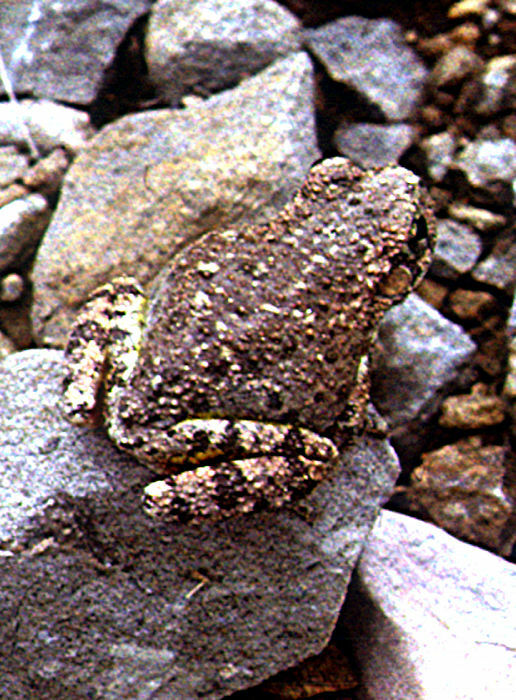 Photographed in the Big Bend National Park, Texas, April 1993. Left: Wily Coyote (Canis latrans) Out in the Noon-Day Sun. 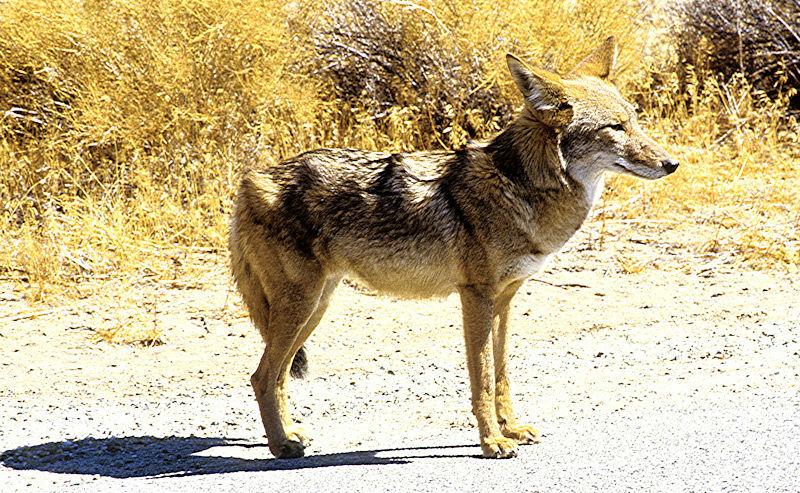 The coyote is a smaller relative of the gray wolf, with 19 sub-species recognised. Native American folklore depicted the coyote as a trickster, rebelling against society. 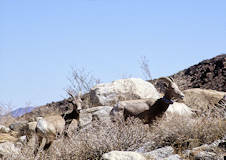 Photographed in the Joshua Tree National Park. September 2004. The Black-tailed Jackrabbit (Lepus californicus), or American Desert Hare, is a common inhabitant of the South-Western USA and Mexican deserts. They eat various shrubs, small trees, grasses and herbs. Jackrabbits are important prey for raptors and carnivorous mammals and host parasitic fleas, ticks, lice, and mites. 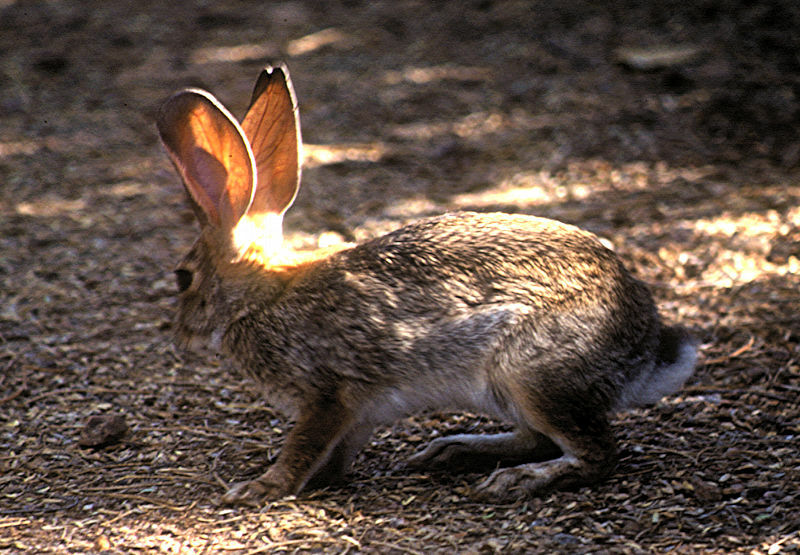 Left: The huge ears of this Jackrabbit catch the evening sun as it forages. Photographed in the Desert Botanic Garden, Phoenix, Arizona. 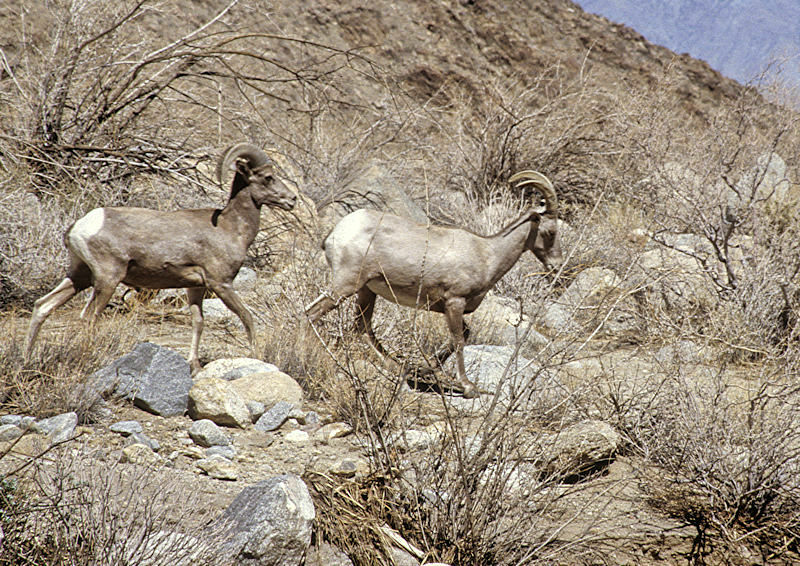 Bighorn Sheep (Ovis canadensis) are named for the impressive horns sported by the males that can account for a tenth of their weight. 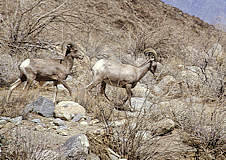 Three sub-species are currently recognised, having diverged from sheep that migrated to North America from Siberia ca. 750,000 years ago. 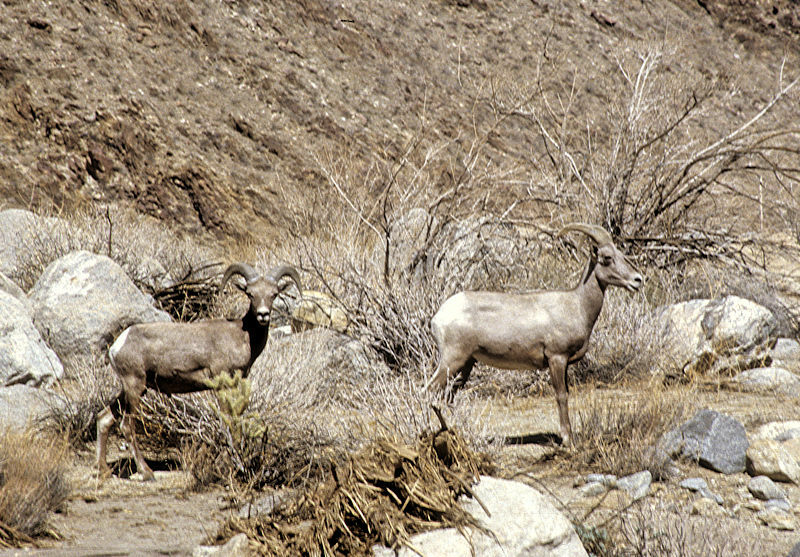 Left: Bighorn Sheep are often seen fleetingly but this small flock in Palm Canyon, Borrego Springs stood their ground between myself and the exit from the Canyon. 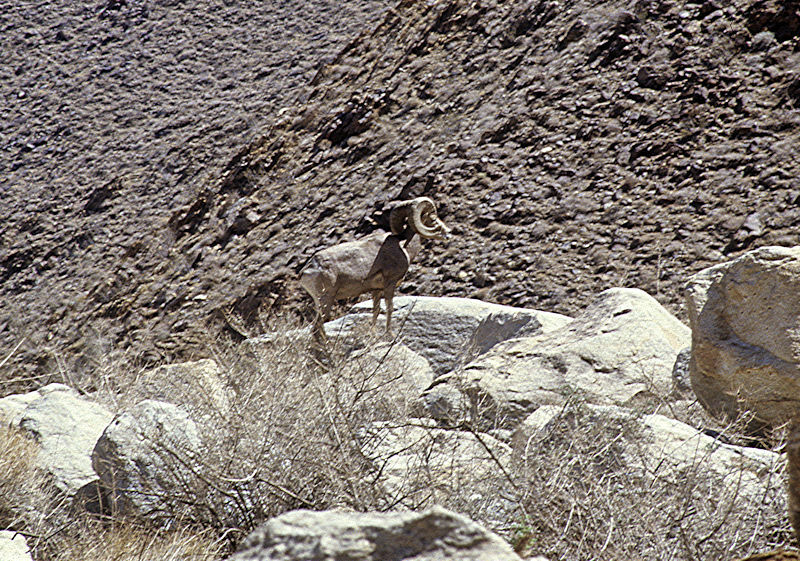 A male with impressive horns stands guard on a rock. One of the sheep is wearing a tracking collar. It was exceedingly hot and I was running low on water so couldn't wait for the herd to move on, but they seemed more interested than bothered as I passed. 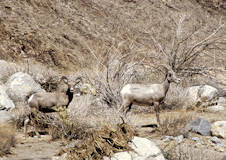 Left: Deer are relatively common in the Big Bend country. 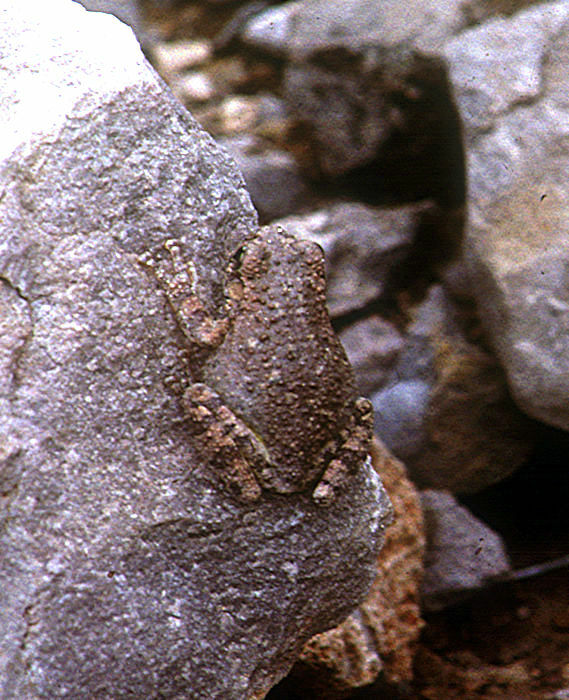 Photographed on the lower slopes of Mount Emory in the Chisos Mountains of the Big Bend National Park, Texas, April 1990. Left: From the wrong desert ? 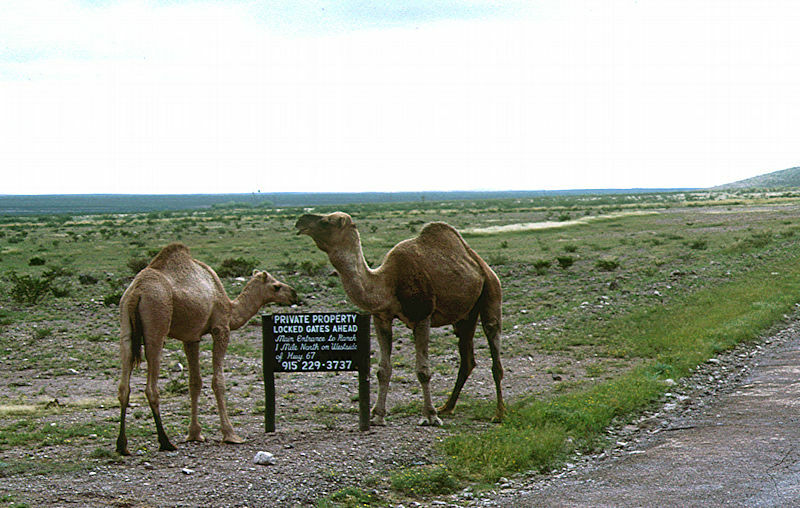 But heat-tolerant camels are very much part of the history of the Big Bend Country, having been introduced to the arid American South-West as a mid-19th century US army experiment to help with transporting supplies. 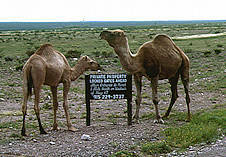 The experiment was ended by the civil war, but some camels remain and are used for camel trecking. 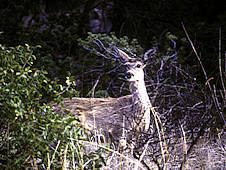 Photographed South of Shafter, October 2003. 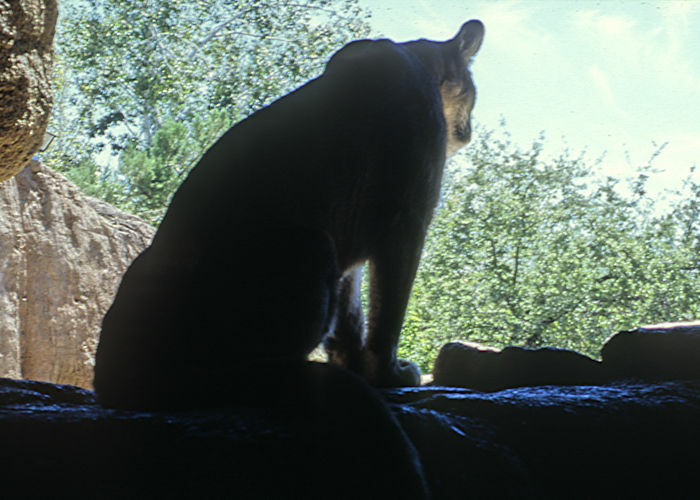 In theory, lions can be seen in the mountains of the US South-West, but are somewhat elusive. 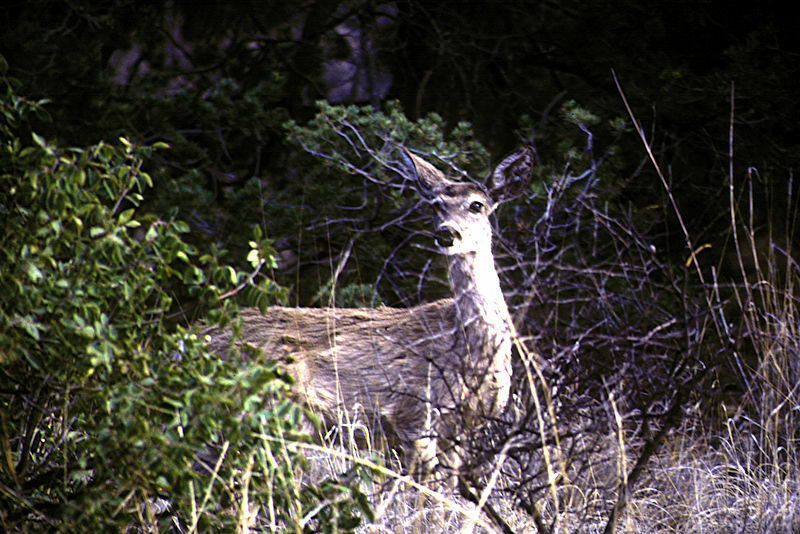 However, it is not uncommon in the Chisos Mountains to find a forest glade that has been marked with the unmistakable scent of cat and a warning to leave the area. Photos: Desert Museum, Tuscon 2004. 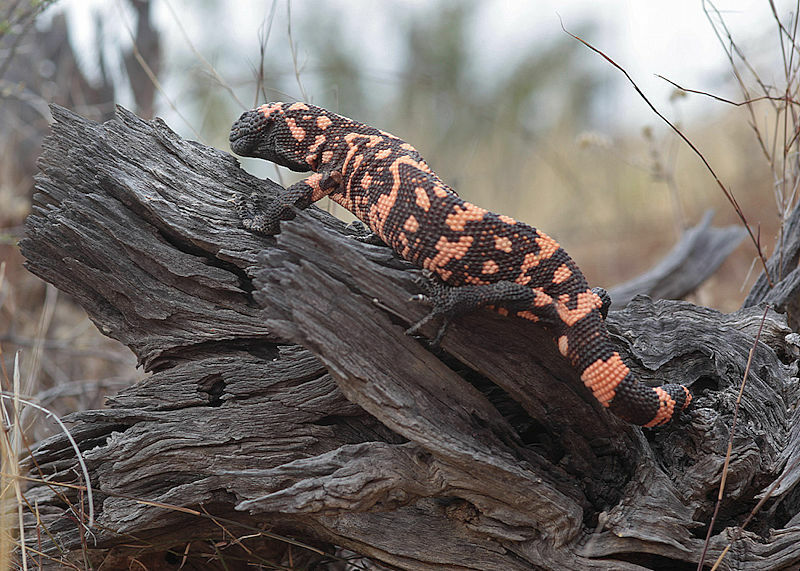 The Gila Monster (Heloderma suspectum) has a characteristic appearance of being covered by pink and black (or white and black) Indian bead-work. 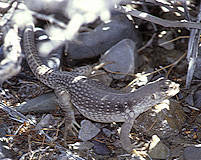 The genus name means "studded skin". 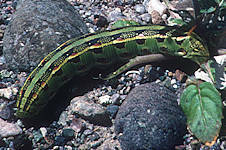 Helodermatids are often regarded as living fossils. 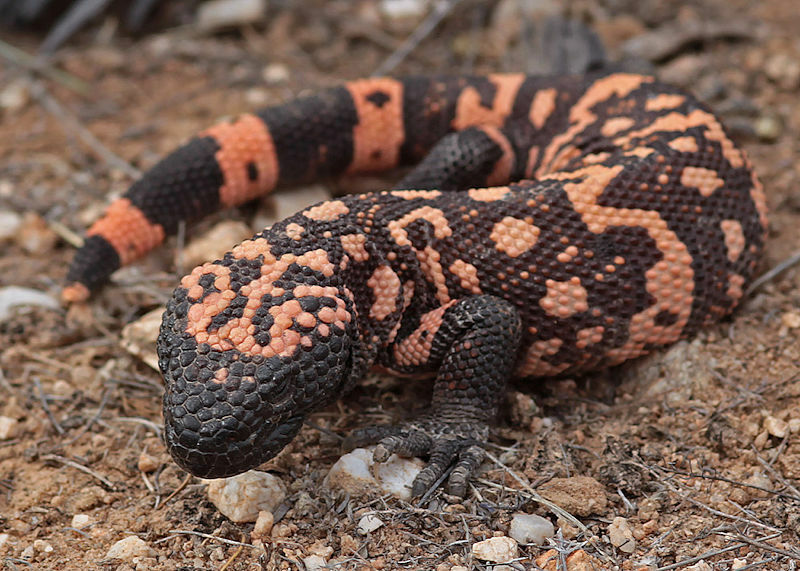 The Gila Monster is native to the South-Western USA and the Mexican state of Sonora. 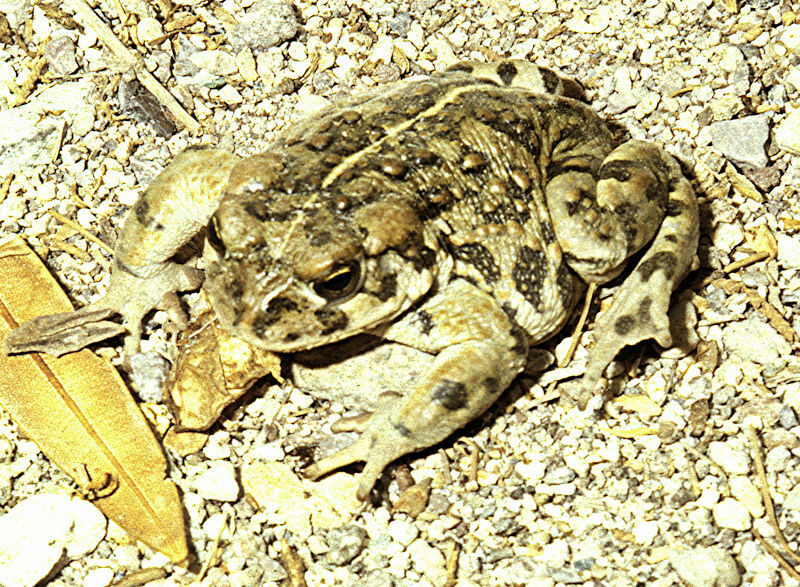 The common name refers to habitat area around the Gila River of Arizona and New Mexico. The Gila monster feeds on bird and reptile eggs and also on small animals and carrion. Food is located by an extremely sensitive sense of smell. 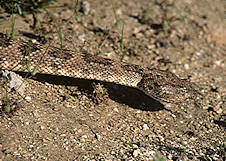 The Gila Monster is venomous with a similar venom composition to that of the coral snake and delivered by grooved teeth. However, it is unclear if there is sufficient of the neurotoxic venom to kill a healthy man as those who died after being bitten were in poor health. 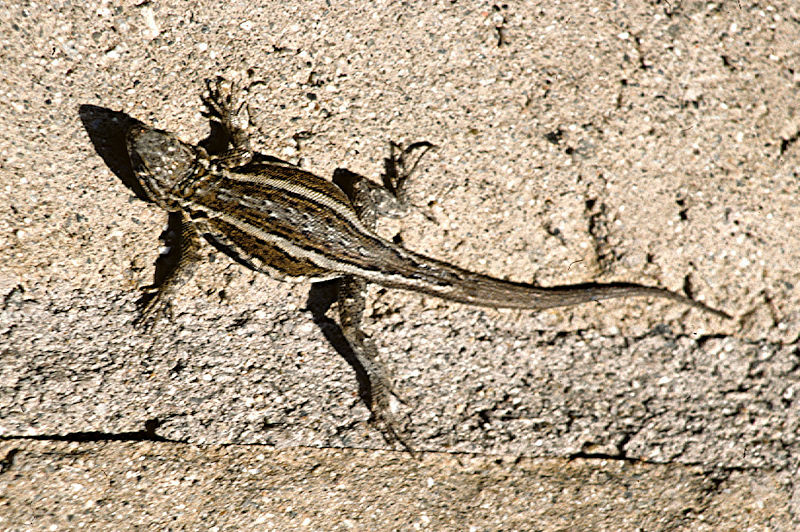 These slow-moving lizards are protected by law and being bitten may be seen as a sign of undue interference. Left: Photographs of Gila Monsters by Alan Francis. 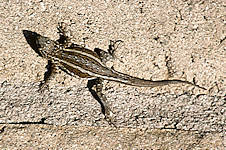 Where there are warm rocks to sit on in the sun, there are usually lizards to be seen. Crevices between rocks also provide a place to hide. Upper left: A male Greater Earless Lizard (Holbrookia texana) sporting Spring courtship colours in the Burro Mesa runoff area, Big Bend National Park, Texas. April 1990. 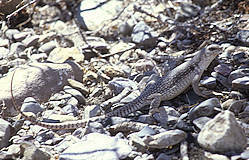 Lower left: The female Greater Earless Lizard does not adopt bright colours in the Spring and is well camouflaged against the rocks. She relies on staying absolutely still to avoid detection, which is a reasonable strategy faced with predators such as snakes and larger reptiles whose vision is relatively insensitive to stationary objects. 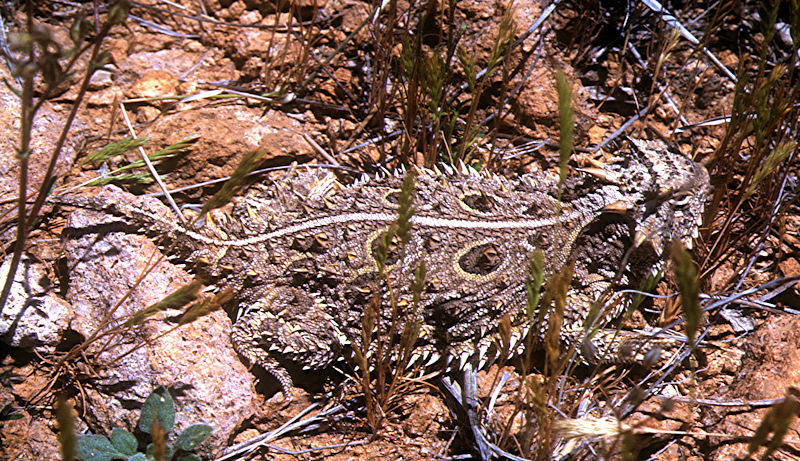 Left: A large Spiny Lizard under an Opuntia in the Boyce Thomson Arboretum, Arizona. 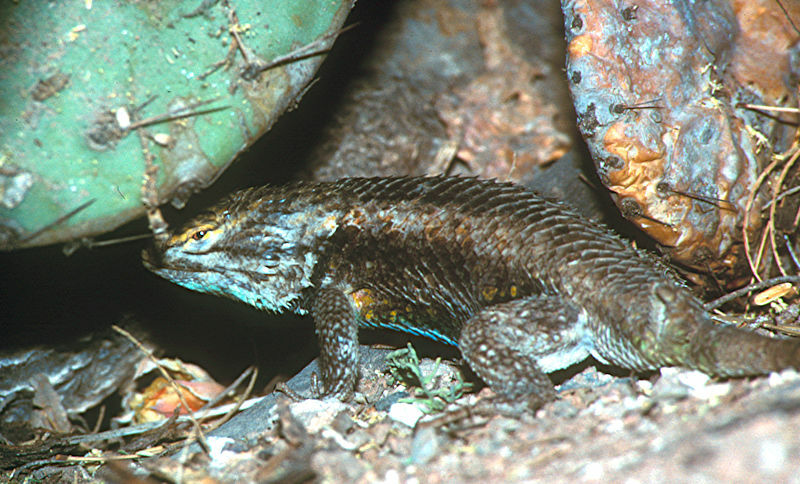 Spiny Lizards eat insects. 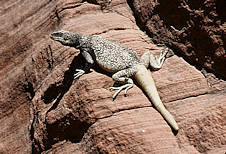 Left: Common Chuckwalla (Sauromalus ater) female basking in the sun on a hot rock face. This large lizard didn't seem at all bothered by my presence, unlike most other lizards. Photo: Valley of Fire State Park, Nevada 2006. 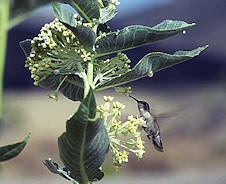 Chuckwallas are mostly herbivorous, enjoying flowers, fruit and leaves with the odd insect for variety. They are said to be especially partial to yellow flowers. Chuckwallas obtain all the water that they need from their food and store water in special tissues in their tail. 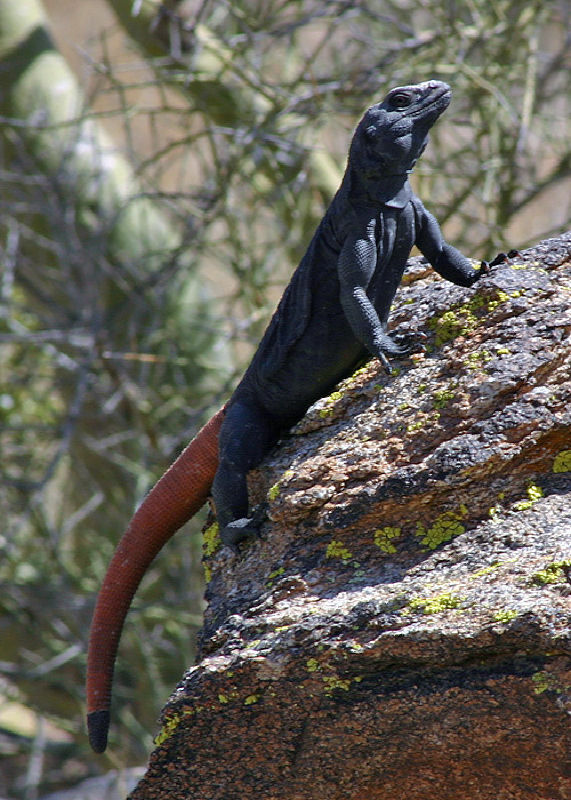 The Common Chuckwalla is native to a large range from Southern California, Nevada & Utah, Western Arizona and North-Western Mexico. 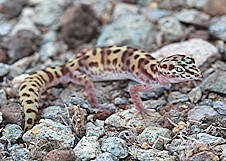 Four other species of Chuckwallas are native to Baja California and adjacent islands in the Gulf of California (Sea of Cortez). Left: Common Chuckwalla (Sauromalus ater) orange-tailed male, characteristic of a population in South Mountain Park, Phoenix, Arizona. 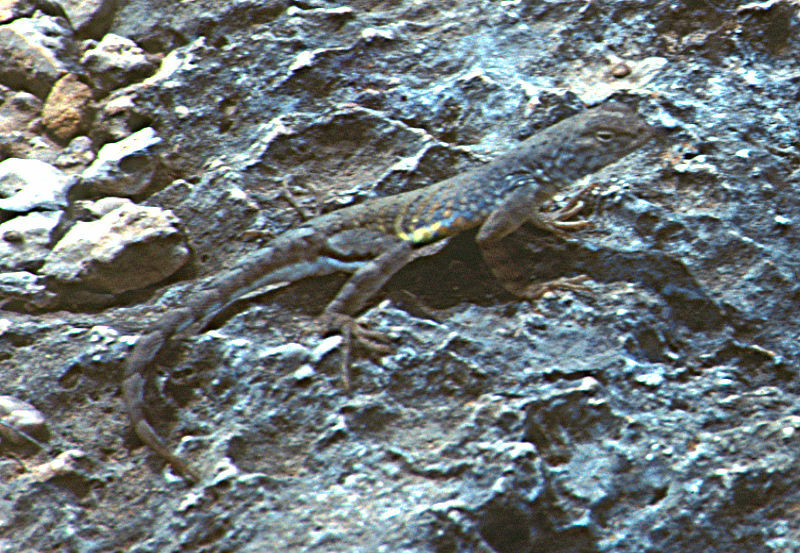 Left: Striped Plateau Lizard (Sceloporus virgatus) on a vertical rock face. 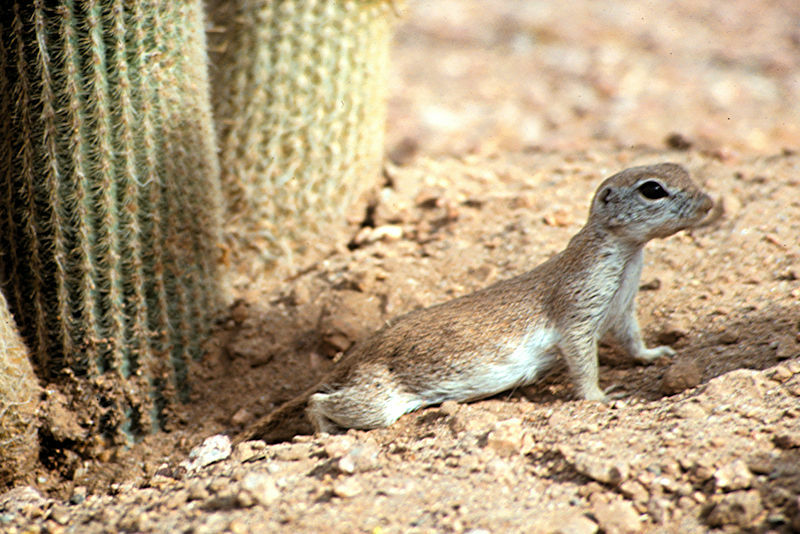 Native to South-Eastern Arizona, South-Western New Mexico and Mexico (Western Chihuahua, Eastern Sonora). Left: Desert Iguana (Dipsosaurus dorsalis). 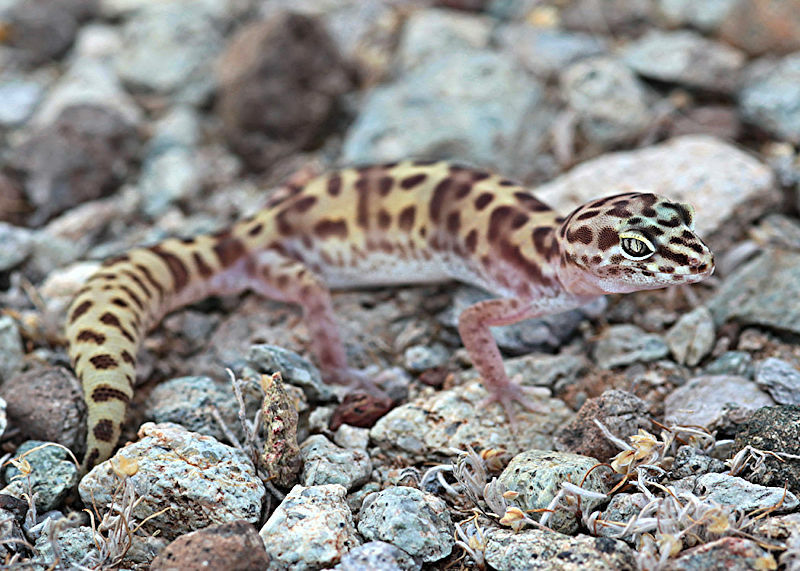 A very common inhabitant of the Sonoran and Mojave deserts, but not easy to get close enough for a photograph. Photographed at Death Valley Overlook, September 2004. Native to the Mojave and Colorado deserts. 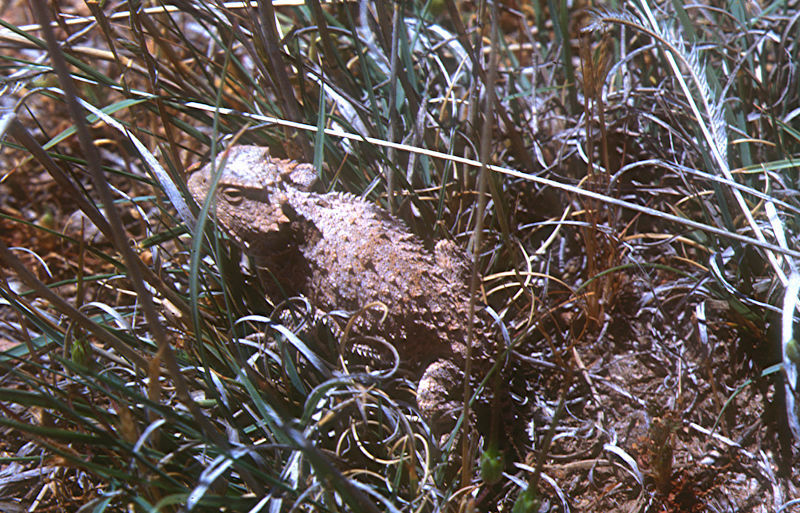 Top left: Texas Horned Toad (Phrynosoma cornutum) Texas State Reptile. City of Rocks State Park, New Mexico 2005. Horned toads, actually lizards, are fascinating creatures with heads that resemble medieval gargoyles and eyes that can swivel independently. Their skin changes colour a little to blend in with the background. They are usually quite docile, happily sitting on the palm of one's hand, even being a little hard to dislodge after discovering that it's a nice warm place to sit. Texas Horned Toads have a rather restricted diet and they only really enjoy harvester ants, which sadly are under threat from other species of ants invading from Mexico. 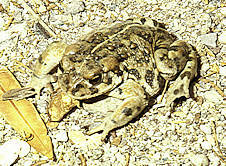 Native to the Oasis Valley in the Amargosa Desert between Springdale and Beatty and considered endangered. Photographed at Beatty, September 2004.
clinging to a boulder South of Shafter, Texas. This tiny amphibian was a long way from obvious water but breeds in transient pools left after rain. It is amazing how quickly tadpoles can appear in a rock baisin after it's filled by rain. 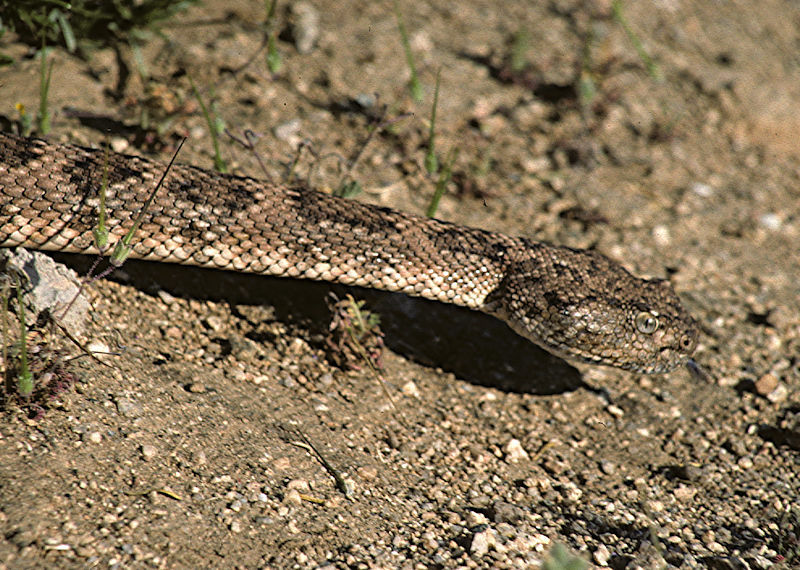 During dry weather it spends much of its time in a dormant state, hiding in burrows or cracks in mud or other damp places. Left: Never examine the flowers on a bush without looking underneath it first. Especially in Texas. 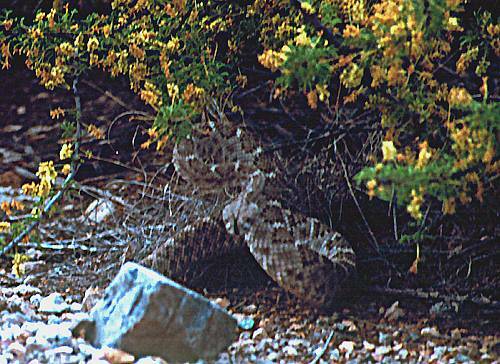 An angry black-tailed rattlesnake (Crotalus molossus) photographed under a flowering Acacia in a canyon in the Big Bend National Park, Texas, April 1993. Had to edge past it to get to my supper. 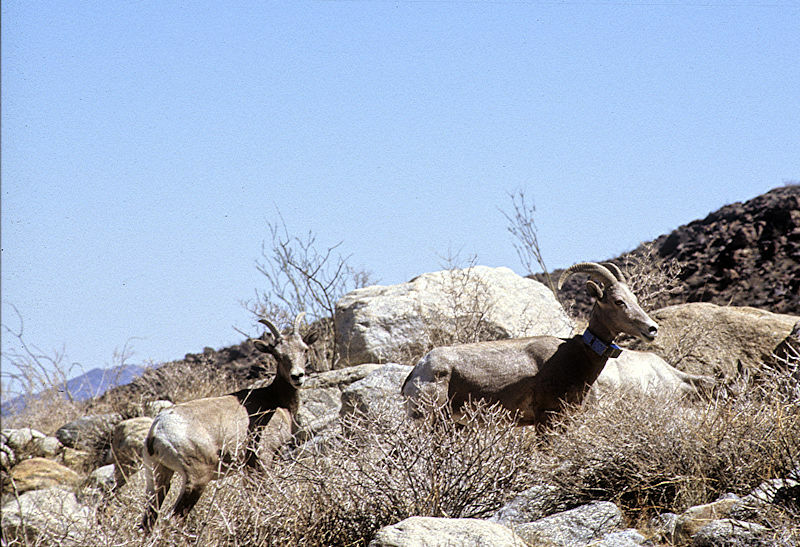 Right: Another occupied shrub in the Anza Borrego Desert State Park. 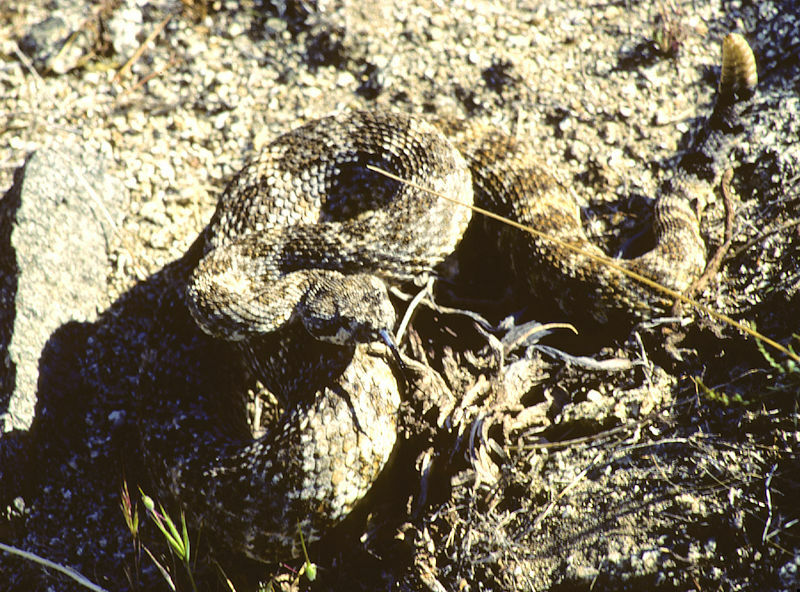 Left: An upset rattlesnake occupying the centre ground of a mountain trail in the Anza Borrego State Park. Between myself and the way down so had to nervously pass it. 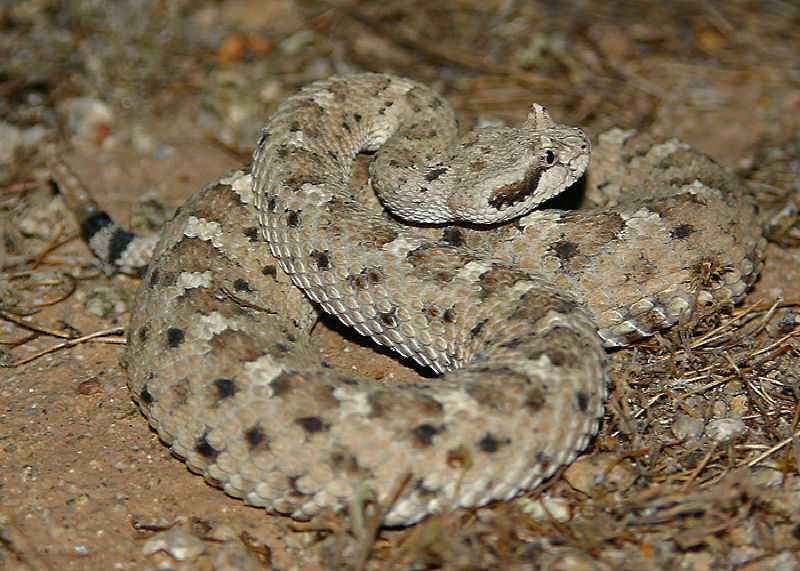 Left: A Mohave rattlesnake in the Joshua Tree National Park. This one was mainly interested in hunting for its supper and didn't rattle even once at the photographer. It eventually disappeared into a gopher hole. Left: A 5 ft. long Sonoran Gopher Snake Pituophis catenifer affinis seen sunning itself in the middle of the road on 2 consecutive days, Puerto Blanco Drive in the Organ Pipe National Monument. 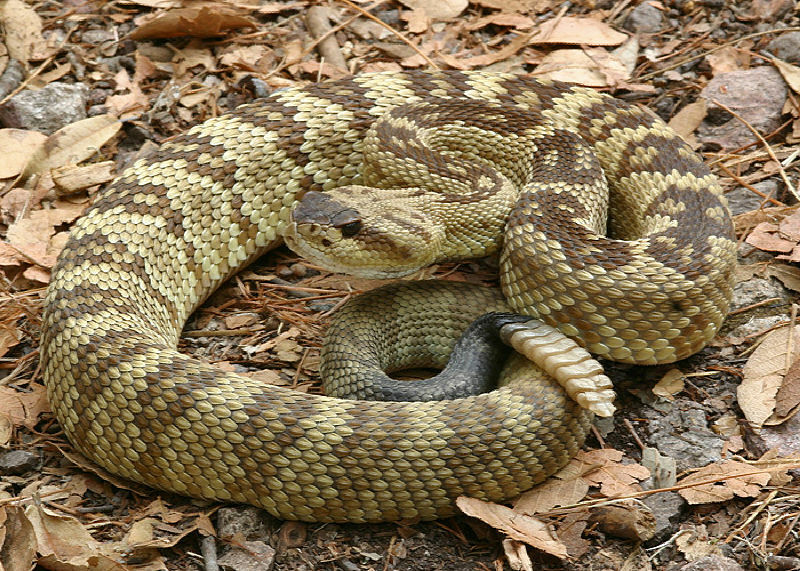 Unfortunately, this habit leads to the demise of many snakes by being run over. 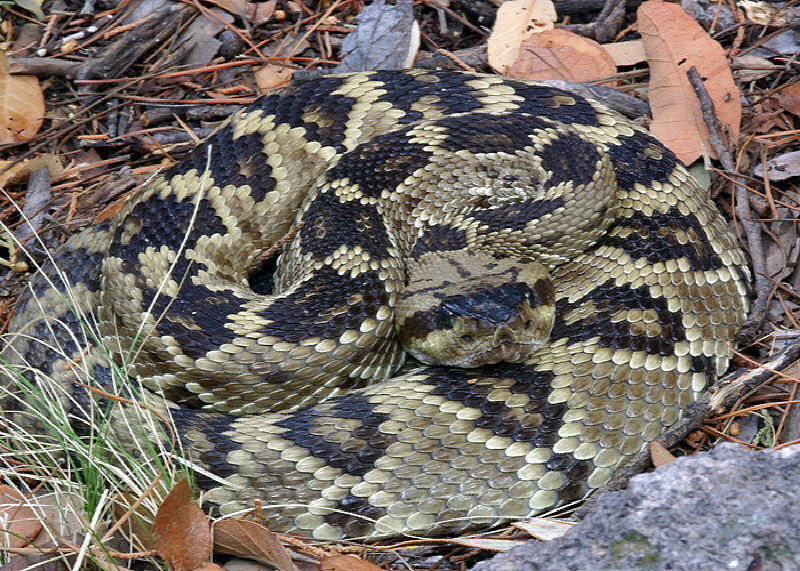 This mostly harmless snake's diet includes small rodents. 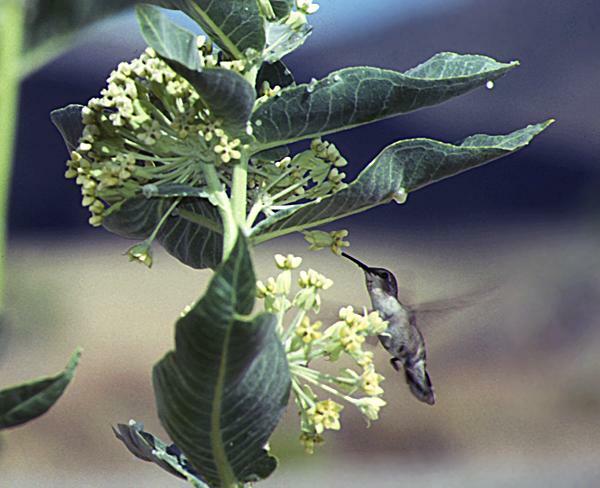 Left: A green humming bird feeds on nectar from the flowers of desert milkweed Asclepias erosa by the road side adjacent to Turquoise Mountain near Chloride, Arizona. Asclepias flowers generally produce generous quantities of nectar, which may sometimes be seen forming droplets in the flower centres. They are attractive to bees, butterflies and humming birds. Male green humming birds are quite territorial and may get upset by an unwary photographer getting too close to "their" flowering plant, which in the desert may be the only source of nectar for some distance. Being "buzzed" by these tiny birds is an interesting experience. 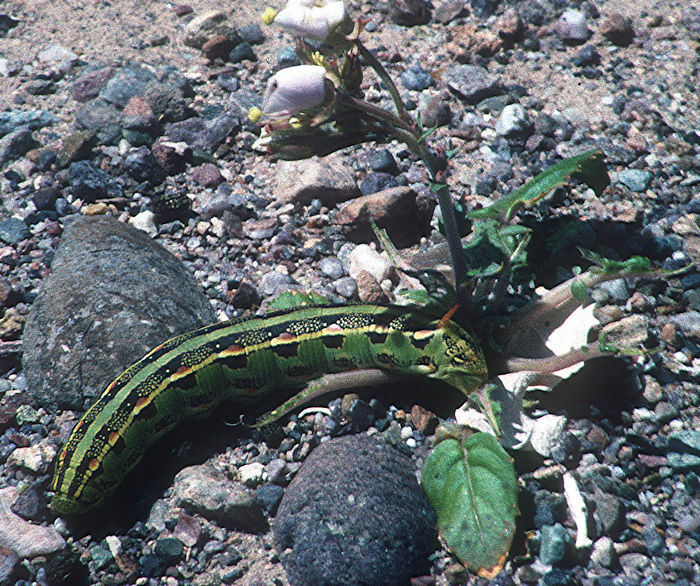 Left: White Lined Sphinx Moth larva walking around on the Death Valley salt flats in the heat of the noon-day sun. The horn is at the tail end. These larvae appeared to have been eating the leaves of Evening Primroses, about the only nearby vegetation. They will metamorphose into one of the largest moths, sometimes called a hummingbird moths as they can hover near to a flower while feeding on the nectar. For such juicy morcels to survive out in the open without attracting attention from birds, they must be unpalatable or toxic. 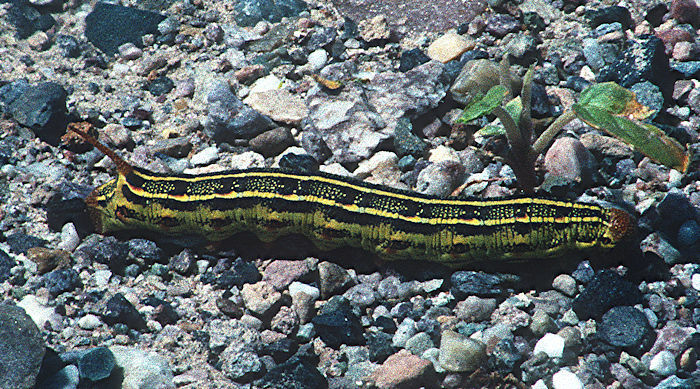 I was surprised that these caterpillars appeared to be able to walk on the alkaline salt without apparent harm and even find refuge in a hole in the salts. Left: This yellow millipede on limestone gravel by the Pecos river bridge near Langtry, Texas was about 4 in (100 mm) long and as thick as a pencil. These millipedes are harmless, unlike some of their relatives in the tropical rain forests which have a deadly poisonous bite. They walk around freely in the open, scavenging for decaying vegetation. 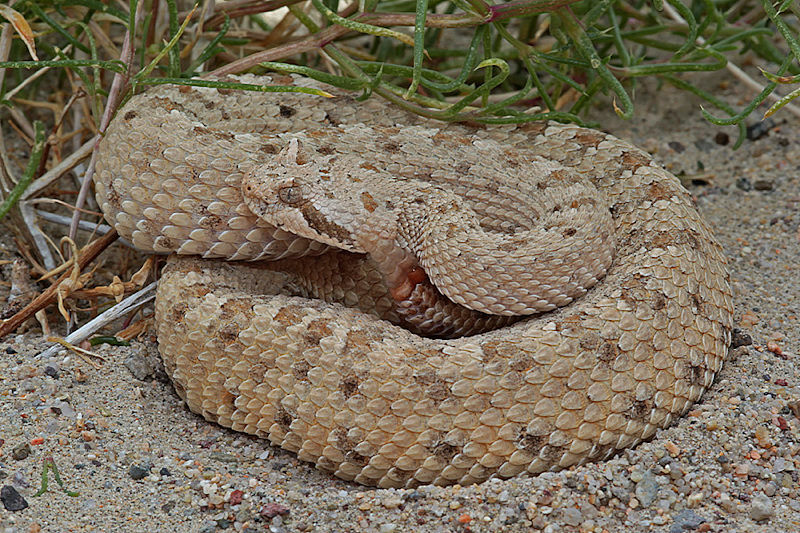 When disturbed, they roll up into a tight loop and can exude a brown liquid which is toxic to insects and presumably distasteful to birds, which seem to leave them alone. 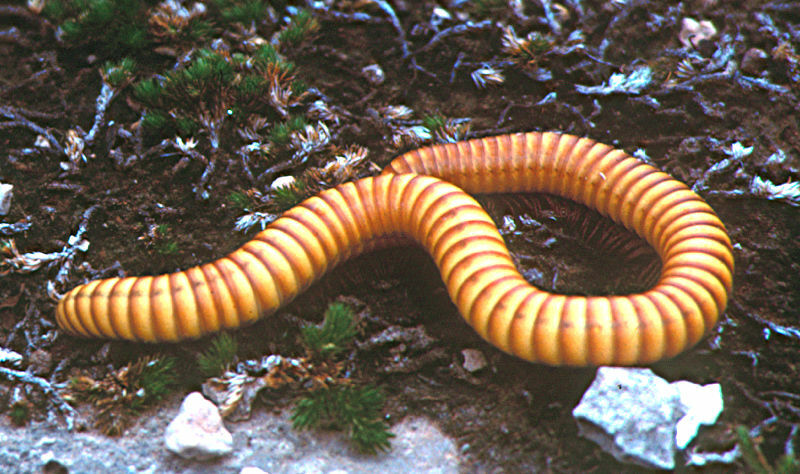 Millipedes in Texas and elsewhere come in yellow, brown and black. As they grow, they periodically cast off their epidermis. These discarded relics and those from dead individuals can be found, bleached and white, throughout the deserts of the South-West. 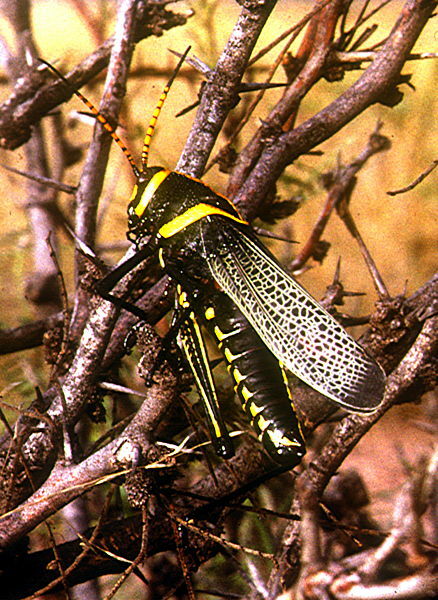 A variety of large grasshopper-type insects can be seen in the deserts of the world. 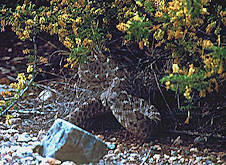 They often remain motionless, relying on their excellent camouflage to hide them from predators. 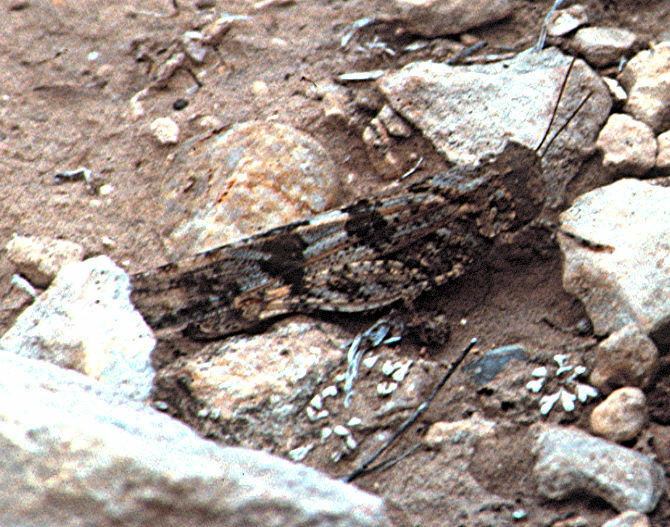 Extreme left: Grasshopper (ca. 2 in) at Langtry, Texas. Left: Horse Lubber Grasshopper in a bush near Marfa, Texas.